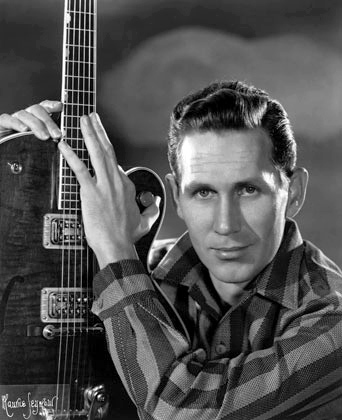 Chester Burton "Chet" Atkins (June 20, 1924 – June 30, 2001), known as "Mr. Guitar" and "The Country Gentleman", was an American musician, occasional vocalist, songwriter, and record producer, who along with Owen Bradley and Bob Ferguson, among others, created the country music style that came to be known as the Nashville sound, which expanded country music’s appeal to adult pop music fans. He was primarily known as a guitarist. He also played the mandolin, fiddle, banjo, and ukulele. Atkins’ signature picking style was inspired by Merle Travis. Other major guitar influences were Django Reinhardt, George Barnes, Les Paul, and, later, Jerry Reed. His distinctive picking style and musicianship brought him admirers inside and outside the country scene, both in the United States and abroad. Atkins spent most of his career at RCA Victor and produced records for the Browns, Hank Snow, Porter Wagoner, Norma Jean, Dolly Parton, Dottie West, Perry Como, Floyd Cramer, Elvis Presley, the Everly Brothers, Eddy Arnold, Don Gibson, Jim Reeves, Jerry Reed, Skeeter Davis, Waylon Jennings, and many others. Rolling Stone credited Atkins with inventing the "popwise "Nashville sound" that rescued country music from a commercial slump", and ranked him number 21 on their list of "The 100 Greatest Guitarists Of All Time." Among many other honors, Atkins received 14 Grammy Awards and the Grammy Lifetime Achievement Award. He also received nine Country Music Association awards for Instrumentalist of the Year. He was inducted into the Rock & Roll Hall of Fame, the Country Music Hall of Fame and Museum, and the Musicians Hall of Fame and Museum.